Jack Tretton, President and CEO of Sony Computer Entertainment of America, kicks off the conference (20 minutes late) and talks about their ongoing commitment to the PS Vita with 85 new games scheduled to launch in 2013, including God of War, Final Fantasy 10 and 10-2HD and Telltale's The Walking Dead. Titles coming to the PS3 later on this year include The Last of Us, Puppeteer, Rain, Beyond Two Souls, and Gran Turismo 6. A new trailer for Batman: Arkham Origins is shown, fleshing out the story and introducing an old friend. PS3 users will get exclusive DLC for the game!?trailer??website? Though no footage was shown, an exclusive Grand Theft Auto 5 bundle will be out later this year for $299.?video? The PS4 is finally revealed by Andrew House. Looking like a souped-up PS2 set on Italic, Sony are maintaining their media center philosophy with an emphasis on all aspects of digital entertainment including games, music, movies and television shows - featuring exclusive content from the likes of Sony Entertainment that can be streamed to both smart phones and pads. Netflix and Flixter will also be available, with Redbox appearing on the PS3 soon.?video? Shu Toshida reveals that 40 PS4 games are currently in development, 12 of them new IP's. Militaristic/steampunk title The Order: 1886 is shown as one of the upcoming IP's, and other upcoming PS4 titles include Killzone: Shadow Fall, Driveclub, InFamous: Second Son, and Knack. A real time tech-demo called The Dark Sorcerer from Quantic Dream is shown, featuring voice work from David Gant. The lead character is the "old man" face demo that was shown a while back, and the still image we got did it no justice whatsoever - this is a very cool video that's definitely worth watching.?video? Bastion creators Supergiant Games unveil Transistor, set for release on the PS4 early next year.?trailer??website? Indie game showcase! The PS4 will be seeing a host of titles from small development studios, such as Don't Starve, Mercenary Kings, Octodad: Dadliest Catch, Secret Ponchos, Ray's Dead, Outlast, Galaks, and Oddworld: New & Tasty - an HD remake of the very first game in the Oddworld franchise. ?video? The PS3/PS4 versions of Diablo 3 will receive exclusive content in the form of items from various Sony IP's, which is kind of cool even if it's just fluff. Tetsuya Nomura reveals that Final Fantasy Versus XIII has resurfaced, rebranded XV. Will it be enough to revitalize the dying franchise??trailer??website? Kingdom Hearts 3 was also announced to much fanfare - no details other than the announcement itself though.?trailer? While FFXI and KH3 will not be exclusive titles, Sony have grabbed console exclusivity for Final Fantasy XIV: A Realm Reborn which will be released on both the PS3 and PS4. A live presentation of Assassin's Creed: Black Flag goes pear-shaped as the game stutters before eventually locking up entirely. Oops...?trailer??website? Jonathan Morin (out of breath from having to run on to cover for AC4's botched presentation) shows us more of WATCH_DOGS, and all is forgiven. The game still looks incredible and Playstation users will receive exclusive additional content in at least 1 hour's worth of extra gameplay and an alternate costume for the lead character.?trailer??website? NBA2K14 is shown. Sony handled this well - despite being sports-oriented it was pretty amusing and didn't take up too much time.?trailer??website? A small update on The Elder Scrolls Online was shown together with an announced partnership with Bethesda, that will see the beta released on PS4 ahead of other platforms.?trailer??website? Mad Max is announced, much to the disappointment of everyone who thought it was Fallout 4. The guy in the trailer looked a lot like DmC's Dante to me...?trailer? 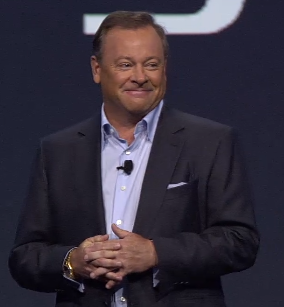 Jack Tretton takes the stage again, reborn as the savior of console gaming. In one of the most unexpected and brilliantly awesome turns of E3, Tretton announced that the PS4 will support used games and the ideology of true consumer ownership, and that the PS4 will not need to be connected online or authenticated periodically in any way, shape or form.?video? The Playstation+ service will be expanded to include group voice chat and other features, and the Instant Game Collection will continue with PS+ members receiving Driveclub, Don't Starve, Outlast and Secret Ponchos for free when the PS4 launches. Current PS+ members will have their accounts carry over to the new console. Gameplay of the upcoming Activision/Bungie title Destiny is shown off for the first time, which will featuring class-based characters and a Borderlands-style loot system. Coming 2014!?trailer??website? More about Dave Perry's Gaikai Online Gaming Library is announced, stating the the cloud service will be available for the PS3, PS4 and Vita in 2014. And the big one - the PS4 will retail for $399 in the US, €399 in European territories, and £349 in the UK. That's a full $100 less than the XBox One and shows that Sony's going for the throat in the upcoming console war. ?trailer?